Embark on a Moose Safari and stay with us! Reserve your spot today - call us at 866-223-1380 or email us. BIG WAVES, BIG FUN, & SUMMER SUN ! Class III - V+ May - Oct. 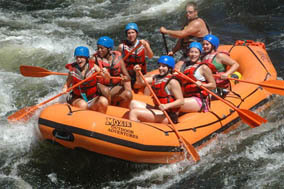 The Kennebec River in Maine offers whitewater rafting adventure for fanatics to families. It's not long after we launch our rafts before the speed of the river begins to pick up and the waters begin to churn white. As we enter the steep granite walls of the Kennebec Gorge large waves can be seen ahead. From this point on the river plunges 12 miles through the gorge creating crashing wave rapids like "Big Mama", "Whitewasher" and "The Alleyway". The high point of the day is the run through class V Magic Falls. We stop briefly at the Middle River access point to pick up younger passengers. 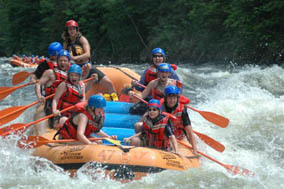 Rapids continue through out the day. There is plenty of time for swimming and enjoying the river including stopping along the river bank for a steak and chicken barbeque . Free pick-up and van transportation from our Northwoods Outfitters location in downtown Greenville! 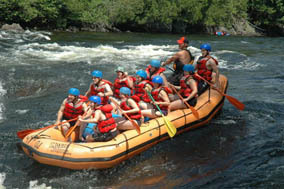 River Fact: The Kennebec River in Maine flows 7 days a week all season long..
Wetsuits are available for rent. Approx. 40 min. drive to raft base. 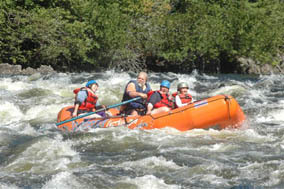 Maine ATV Rental , Moose Tours and Wildlife Safaris, Whitewater Rafting in Maine, Maine Snowmobile Rentals.